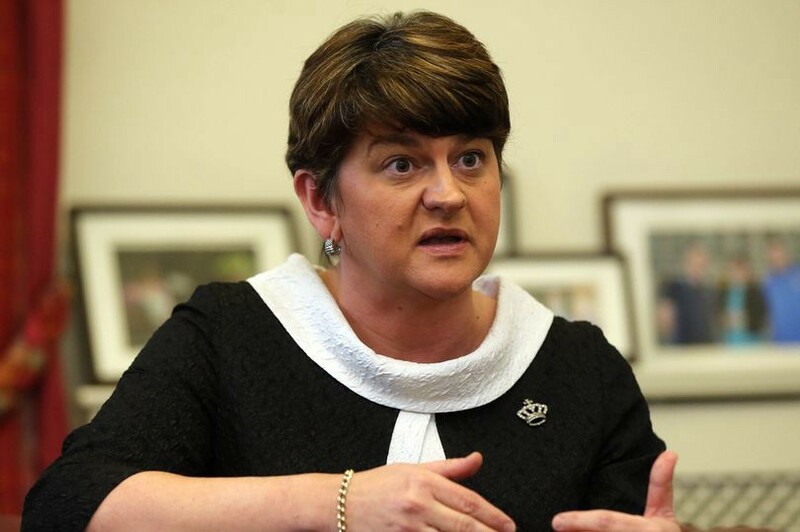 Arlene Foster, who found herself under pressure in the Northern Ireland Assembly due to the ‘Cash for Ash’ scandal. Long before she became one of the most powerful women in Westminster following the 2017 general election, the DUP’s Arlene Foster was facing intense media scrutiny over the Northern Ireland Assembly’s ‘Ash for Cash’ scandal. 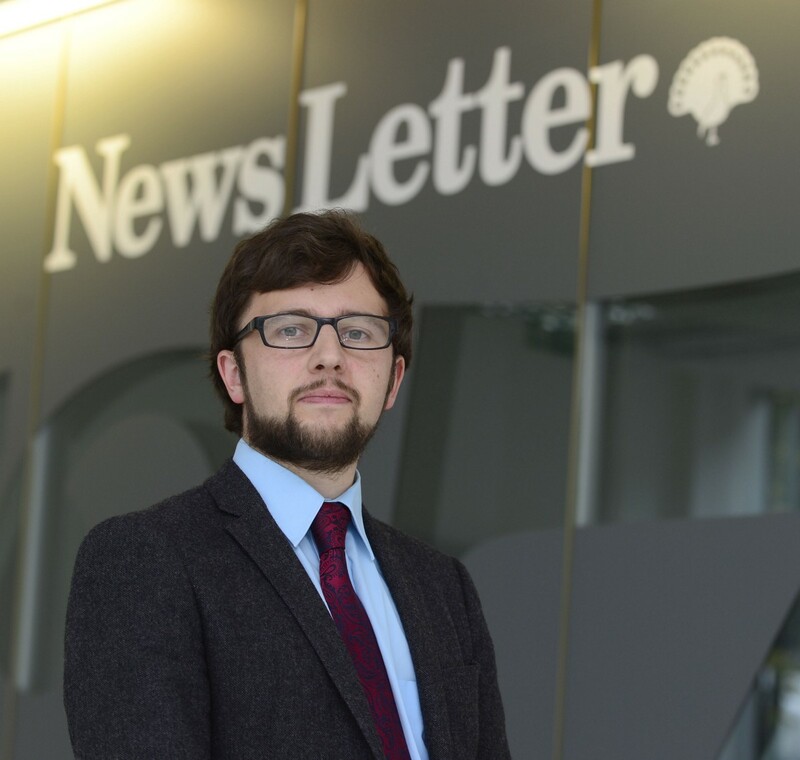 News Letter political editor Sam McBride looks back at a story which required determination, an iron will to get to the truth, and which may still have a good way to run. Looking back, the moment when the News Letter’s coverage of the Renewable Heat Incentive scandal broke through was the point at which a weak editor would have thrown in the towel. 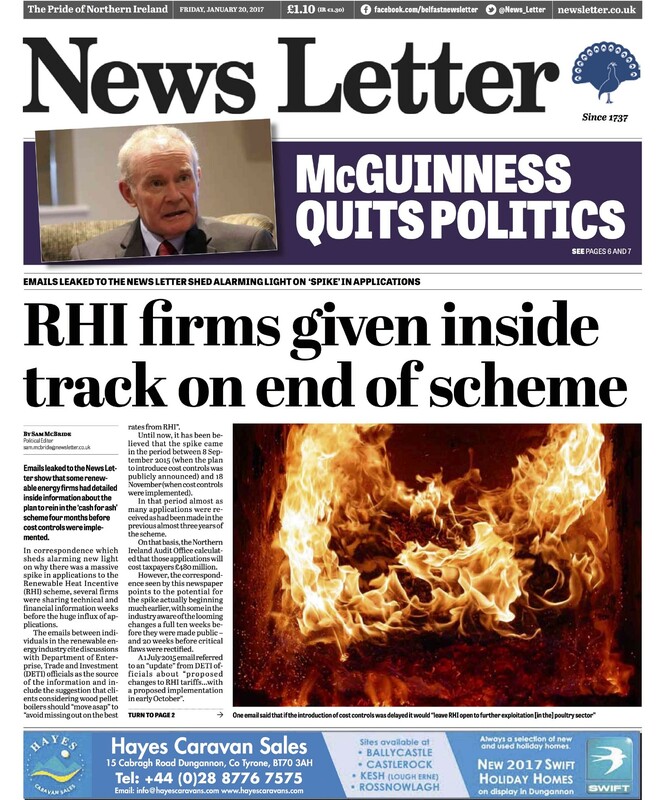 On new year’s eve at the end of 2016, the News Letter’s front page revealed yet another instance where the Stormont department which for seven years had been led by Arlene Foster had been warned about the potential for the RHI scheme to be abused. By that stage the paper, along with some other media outlets in Belfast, had been covering the ‘cash for ash’ scandal for three weeks after BBC Northern Ireland’s investigative programme Spotlight had revealed that a whistleblower had been ignored after she went to Mrs Foster, who by 2016 was DUP leader and First Minister of Northern Ireland, to personally warn her of the ‘burn to earn’ abuse of a scheme which had been set up without cost controls. Through feedback from readers — aided by the Chartbeat data analytics which showed in real time what was being read on the website — we could see from the outset that there was an unusual public thirst for information about a story which in other circumstances could have been seen as too heavy and complex to resonate with the public. Senior DUP figures privately accepted that although our coverage of the story was deeply uncomfortable for Mrs Foster it was legitimate. That seemed to change on new year’s eve when Brian Haslett, an employee in Mrs Foster’s party office, tweeted to denounce the News Letter’s “bias tripe [sic]”. He called for the paper to be boycotted and praised the other media — which had shown little appetite for investigating the RHI scandal. Among the DUP members who ‘liked’ his tweet were two serving DUP MLAs — Phillip Logan and Gary Middleton. But, rather than become a more pliant newspaper, the News Letter reported the boycott threat and saw a groundswell of support from readers — including a DUP councillor who publicly said he would not be boycotting the paper. Then, when asked if the views of Mrs Foster’s assistant were those of the party, the DUP said that they “do not represent the party’s position”. The story was picked up on social media, by the Irish News, Press Gazette, the Slugger O’Toole political blog and by others. Inadvertently, the boycott call drew attention to what the News Letter was uncovering and suggested to many members of the public that if some of those close to Mrs Foster wanted the story suppressed, then it must be worth reading. In the weeks after that incident, I was in the unusual — but happy — position of passing on to our distribution department multiple reports of the News Letter being sold out — sometimes as early as 9am. As we delved further into what had gone on and led the calls for the setting up of the public inquiry before which Mrs Foster will appear in just over a week, on some days, circulation went up by more than 1,000 copies — a rare feat in a period of falling print sales — and website records were smashed. Two people contacted me to say they were cancelling their subscription to another newspaper and buying the News Letter, voting with their wallets to support what we were doing. The News Letter demonstrated its independence — not only in exposing a story which some in the DUP wanted glossed over, but in refusing to support the opposition demands that Mrs Foster should step aside as First Minister. In our view, the crucial issue was securing an independent public inquiry to examine the matter. If that inquiry was truly independent, then whether she stepped aside or not would be immaterial to its work. Sinn Féin thought otherwise, demanding that the First Minister step aside but for weeks but opposing a public inquiry — with the party chairman denouncing me on the radio as a “juvenile journalist” for highlighting that the sort of investigation the party was requesting would not have the ability to take evidence on oath or to compel evidence. Ultimately, Sinn Féin changed its position and a public inquiry was established under the chairmanship of retired High Court judge Sir Patrick Coghlin. My editor, Alistair Bushe, his deputy, Ben Lowry, and other staff on the paper took bold decisions necessary to allow this story to be reported fully and Johnston Press, the owners of the News Letter, have enabled those decisions to be taken by trusting the team at the paper rather than interfering editorially, as would be the case with some proprietors. 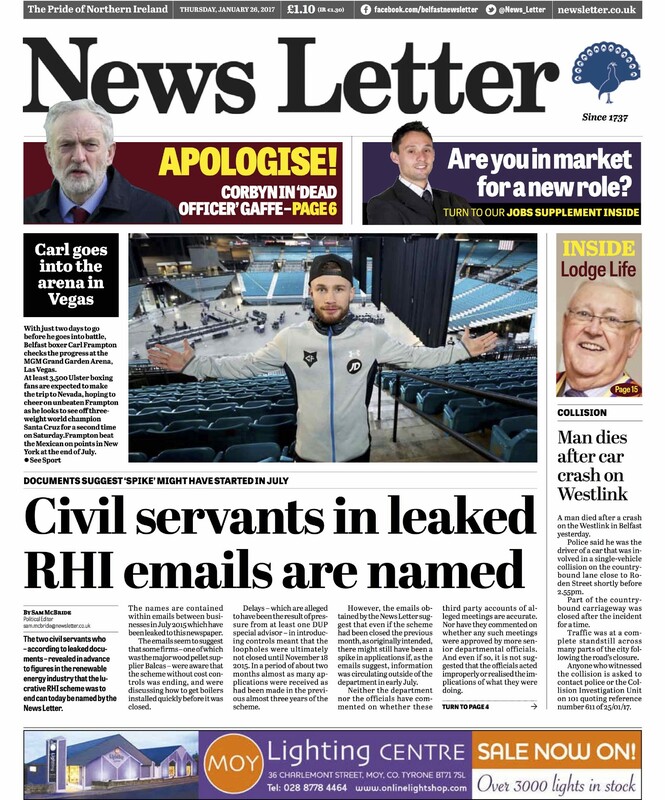 The News Letter — and the i — has continued to cover the story in depth as it unfolds at the inquiry, revealing pieces of information which in some instances make for grim reading for the DUP and which in other cases have raised profound questions about the Northern Ireland Civil Service, showing that some crucial information which officials gave to Mrs Foster was misleading and inaccurate. It is easy for newspapers whose editorial position is closely aligned with a political party or an ideology to be nervous about prominently reporting a story which they believe is in the public interest but which is not in the interest of that party or ideology. But we should always remember that it is our readers — not political parties or governments — who ultimately employ us and it is their voice, rather than that of more powerful interests, which we should hear loudest when making editorial decisions. Not only is that the right thing to do but, as the public response to our coverage of the RHI scandal shows, it is also the sort of decision which can be rewarded with new readers.